Is God required as vital? We don’t start out wanting only one thing. By chastening of the Spirit, by disappointment in life, by presenting a vision through the scripture – or a person – God Himself narrows us down to wanting just one thing. Do you know and want that one thing? “A life of prayer is a radical lifestyle. You cannot walk like the world walks and be aware of God’s presence. If you want prayer, there will be many a ‘no’ in your life. “Your ‘yes’ to God will produce many no’s. David had them. Read Psalm 101 where he makes decisions, drastic choices, for the purpose of his relationship with God. In this teaching, Martha explores what it means to live a lifestyle of prayer through the lives of David, Mary and Elijah—lovers of God who pursued and required as vital just one thing. 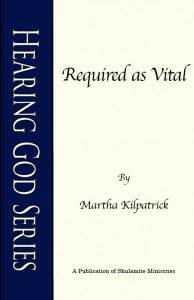 Required as Vital is now available in both print and digital format. Oh, how David knew God! He saw Him in many aspects, by numerous names, born out of his personal experience with the Lord of his life. David’s desires were narrowed down to one desire. Mary of Bethany reduced herself to one choice. And to that “one thing,” the Lord would reduce us all…if we are willing. I didn’t start out wanting one thing. I started out wanting a thousand! But God honed me down from my myriad desires to a single want that became one gigantic want. By chastening of the Spirit, by disappointment in life, by presenting a vision through someone – or through the scripture, or wherever – He narrowed me down to wanting one thing. The Lord narrows you to enlarge you. He reduces you to enrich you. So what is this one thing David wanted? David asked for one thing. He didn’t ask to be king. He didn’t ask for riches. He asked only to be in the Lord’s presence, to SEE Him in all His beauty. What frivolous ambition just to see Him? We think He would have us build a big something for Him, DO a great thing for Him. No, He wants us to want…simply to look at Him, live always before Him, pondering the wonders of Him. A life of prayer is a radical lifestyle. You cannot walk like the world walks and be aware of God’s presence. If you want prayer, there will be many “no’s” in your life. Your yes to God will produce many no’s. David had them. Read Psalm 101 where he makes decisions – drastic choices – for the purpose of his relationship with God. If you choose this lifestyle, you will not only be different from the world, you will be different from other Christians! It is a radical lifestyle, but I believe the richest and highest that mankind can possibly know. Once I came to a phrase in the book of Colossians that said, “devoted to prayer.” The Lord grabbed me on that verse. I looked up the word ‘devoted’ and it means that you give your life to something. As I shared some of these things, a friend said, “Martha, what you are talking about is a life of prayer and what some people talk about is a little section of prayer.” I so appreciated her understanding. “Pray without ceasing” (1 Thes. 5:17)? It seems impossible! However…I prayed for prayer a long time before I really understood prayer. I went years thinking that my prayer life was less than what it should be. Still, I prayed for prayer to be formed in me and to be understood by me. Every year on my list of priorities, of high importance was PRAYER! Many years I would look at that list and grieve because I considered that my prayers were inadequate. I didn’t bother to ask if my praying was satisfactory to the Lord! Always I asked and still ask for prayer. I understand that the Spirit is the source of prayer. Elijah learned how to pray while hidden. Prayer in the fellowship is wonderful, but you don’t learn to pray there. You learn to pray alone. Elijah learned to pray alone and then he was presented with a big challenge when the widow’s child died. Elijah learned to find God’s will and to pray it until it appeared. He put his life into that child; he prayed three times and the child came to life. It was his rehearsal for conquering death. God will give you a small death to overcome and then a bigger death to overcome and then a bigger and yet a bigger. He wants you to overcome the death of the nation! He has big plans for you. But you will only get there by little steps. You know, I think about Elijah in that little obscure town, in a time of dusty drought with one poor widow. And while they did have oil and meal, I don’t read about vegetables. I think during the years he was with her, Elijah probably had quite a restricted life. I imagine he fixed the door hinge. I imagine he went out with his bucket to look for water. I imagine he spent long hours with the Lord. I imagine there was much that was quite ordinary in his life. We assume walking with God is always grandiose and that’s not the telling of the tale. The telling of the tale is the ordinary day—the breakfast table, the PTA meeting, or whatever you have. For me it was soccer games! Then it became college students. Another time it was caring for a dying parent. In the ordinary day, the question – the ONLY question – is: Is He there and are you there with Him? Are you content to be ordinary? Are you treasuring every day because it is spent with Him? Or are you treasuring only the days that you are conscious He is using you? You see, Mary of Bethany treasured every moment. Mary was in ecstasy just to have Him present. Someone said to a woman, “It sounds like you had a happy childhood.” And she said, “I did! But I didn’t know it.” Do you see? Isn’t that how we spend our life? As a mother of adult children, I can tell you, I didn’t know how happy I was when they were small. Oh, to live as ordinary and treasure ordinary duties! There is great healing in ordinary duties. The ability to do them. The privilege of doing them! There is no labor without profit in the Lord. If you do your labor in the Lord, it has profit. If you do your labor as some interruption of grandiose life, then your labor is without profit. His presence is there in the scrubbing, in the working, in the common doing. I believe Elijah had a most ordinary life. But I also believe the man was WITH God. We remember the spectacular, don’t we? We think that is the best there is. No, Elijah spent much more time in the ordinary. Actually, if you count his miracles, he didn’t do many. They were just so spectacular when he did them! You see, when you are alone with God, there is an increase of His power within you. You are not aware of it, but all your time spent in God’s presence increases the power of your spirit. If you are going around preaching to everybody, ministering to everybody, you are dispersing your power. But Elijah stored it up. He stored it up by just being with God. Elijah went up to the mountain to stand in the presence of God. Those are the three things that speak to man of the sovereignty of God. What do we do when there is a drought? We pray. I mean, even the officials pray (or they say they do). What do we feel in the presence of fire? Vulnerability. We had a fire in the woods next to our house one day and I felt very vulnerable to it. Catastrophes speak to us that there is a power beyond our power. And when we have an enemy or a problem that has defeated us momentarily, we need a new insight into the sovereignty and power of God. Elijah had been on Mount Carmel, defeating the prophets of Baal, but he forgot the power of God over Ahab and Jezebel. I can identify with that! He was an ordinary man, remember. Elijah forgot that God could defeat 400 prophets of Baal, which means that God is sovereign. God is GOD! He hasn’t been off His throne for a second! He may let the Jezebels hang around for a while, but He is going to have the last word. And the one who has the last word is the One who is sovereign. He who controls that which is out of control must be God! You see, in these days we are rather removed from our vulnerability to the weather and the elements of nature such as fire. But in that day, when they lived so close to nature, they knew that in the face of a hurricane and a fire and a storm, man is small! Elijah had to see God’s enormous power and sovereignty. I have finally learned that my first work in anxiety is to get rid of it! Then to hear. To let the Word feed me and build my faith. The scriptures say: “Be anxious for nothing.” (Phil. 4:6) First of all, there is no reason to be. He is King! And secondly, you cannot function in the Spirit when you are anxious. We must learn that a state of anxiety is abnormal and how to deal with it. You deal with it by the Word of God and prayer.